Jackie: You ever kill someone? It can get touchy-feely. I like to kill them softly, from a distance. 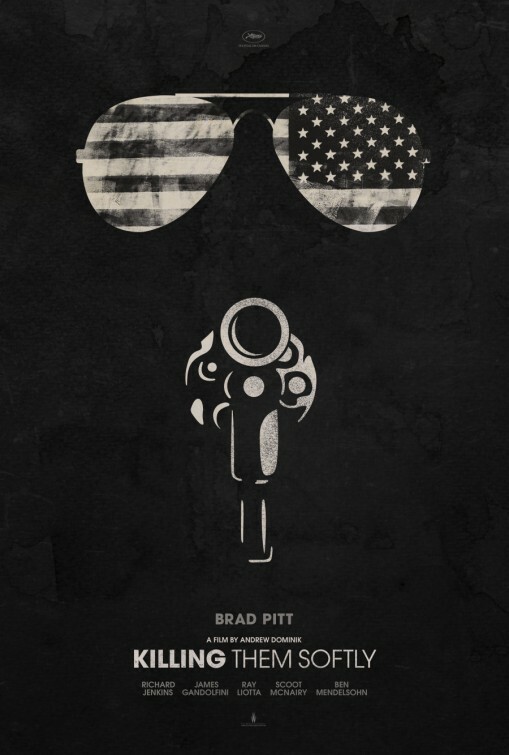 Judging from how many cuts there are in the first few minutes of KILLING THEM SOFTLY, I would say writer/director, Andrew Dominick, took the criticism that his last effort, THE ASSASSINATION OF JESSE JAMES BY THE COWARD ROBERT FORD, was a little too slow, very seriously. 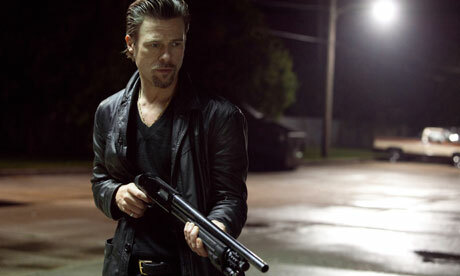 His latest, and second go round with Brad Pitt, is jarring, and aggressively so, from the very start. As a notable campaign speech by then senator, Barack Obama, can be heard echoing through the empty, trash ridden streets of whatever decimated American city this is, it becomes clear that Dominick is less interested in setting an actual scene and much more keen on criticizing the government. If there is any legitimate business happening in this city, Dominick isn’t interested in it. Instead we spend all of our time with the underbelly of society, mobsters, hitmen, petty thieves looking to trade up. A few of the these thieves decide at one point to hold up a mob run poker game because if they don’t pull off a big score, they will never make it to the next playing level. This particular card game had already been held up but that was an inside job, so the thieves just figure everyone will assume it is again this time around. After the card game gets hit, the criminal economy collapses upon itself while the organization scrambles to restore order. All the while, footage or soundbites from the 2008 American election campaign and financial collapse that was happening simultaneously at that time, are incessantly thrown at the viewer to remind us when exactly this all takes place. The insinuation of course is that the actual 2008 economic collapse, that so many people have not quite recovered from yet, mirrors this criminal model in many ways. Those that were in control of the money on Wall Street were getting greedy and were essentially robbing from each other, all made possible through loopholes and regulation. The smaller players aren’t even at the table, just like the disappearing middle class and ever increasing lower class, and the only way they can contend is by doing it by force. And of course the American government itself also seemed to run amuck trying to figure out how to rectify the situation. KILLING THEM SOFTLY thus not so subtly spends the majority of its time accusing the government of killing its people from a distance and not nearly enough time developing a satisfying plot.